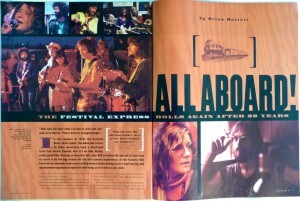 Here’s an article I wrote on the film Festival Express, published in Relix Magazine, April 2004. Drivin’ That Train . . . In the summer of 1970, the Grateful Dead, Janis Joplin, The Band and scores of other musicians took a chartered train trip across Canada. And it’s on film. Really, really good film. Coming to theaters this summer. DVD to follow. But go out of your way to catch it on the big screen for the full concert experience. At the Toronto Film Festival last fall, tears were rolling down cheeks during Janis’s soul bearing, and spontaneous applause erupted mid-song, as if it were a jazz club. Plus, this is the best Jerry Garcia on film. I’ll let that sink in for a minute. And it’s the wildest Band on film; looser, younger and even more alive than The Last Waltz, playing in their home country with the Hawks soaring thru ‘em. The Village Voice said of The Janis Voice: this is “by far the most vivid evidence of her presence ever committed to film.” You will ‘get’ Janis-goose bumps, guaranteed. And the swirling cinematic trip that Beatles Anthology director Bob Smeaton wove together from the 46 hours of uncovered footage is “the third jewel in the crown,” as Dead and culture historian Dennis McNally puts it, grouping it with Woodstock and Gimme Shelter. “Woodstock was a treat for the audience, but the train was a treat for the performers,” somebody said on the train, no one remembers who. But someone did remember a camera and captured the best backstage party these sculptors of modern music claim they ever attended, at a peak in their collective creative lives. “Never had such a good time in my life before,” as Robert Hunter put in “Might As Well,” his ode to the train trip. The Band had just crawled out the window of Dylan’s basement and are sprinting through their solo prime. 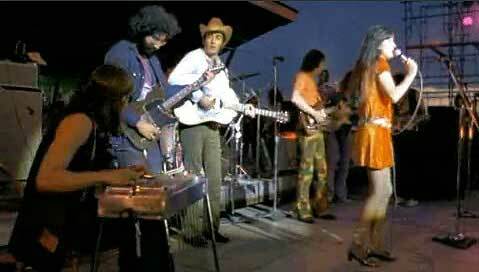 The Dead are in their original-six lineup, Pigpen trim and on harp. They’d just presciently written “Casey Jones,” and preciously recorded Workingman’s Dead-which hit stores the day before the Toronto show and included a brand new song about playing outdoor festivals called “New Speedway Boogie,” which they deliver a fresh-out-of-the-studio version of. Garcia wrote “Ripple” in Saskatoon, and Janis worked up her biggest hit, “Me & Bobby McGee,” just three months before final flameout. It’s like finding a film of Michelangelo sculpting David. “It’s in pristine shape,” testifies film soundmaster Eddie Kramer. Both the audio and video seem like they were recorded last summer, not last century. The pioneering promoter and conductor, Ken Walker, who brought John Lennon to town the previous summer for his historic non-Beatles Live Peace In Toronto show, said, “If we were bringing all the acts together for one festival, why not do more than one? So I got the idea of the private train and started negotiating with CN Railways,” many comical details of which are in the film. The Dead brought along Jerry’s ‘other’ band, The New Riders of the Purple Sage-this being the “Evening with The Grateful Dead” era that included a Riders set with Garcia on pedal steel, and a Dead acoustic set. 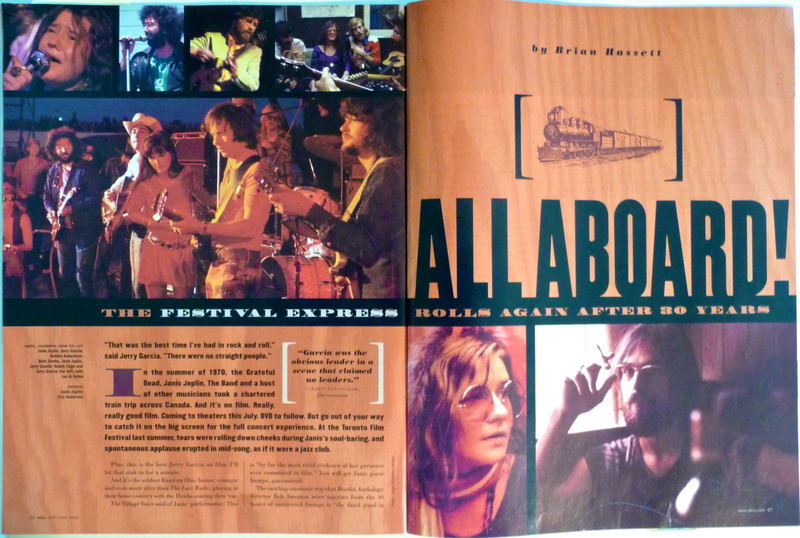 The other lucky gamblers onboard were the Flying Burrito Brothers the month after Gram Parsons left, Delaney & Bonnie, Buddy Guy, Mountain, Ian & Sylvia Tyson’s Great Speckled Bird, Mashmakan, Seatrain, Eric Andersen, the Good Brothers, Tom Rush, plus some local acts in each city, and that ubiquitous festival oddity, Sha Na Na. Traffic and Ten Years After also played the opening Toronto shows and are on film, but not in the movie. And with all these assembled masters in their prime, “Jerry was the natural born ringmaster of that 3-ringed dream train,” as pedal steel pioneer Buddy Cage put it. Not only does he seem to be in on every jam, but also as the crowd gets out of hand at the opening show, it’s Garcia who actually rises to the microphone for a solo stage-front plea for “coolness,” and he initiates the violence-diffusing free concert in the adjacent park. No, but they do have Jerry telling Janis he loves her. And Delaney playing “Goin’ Down The Road Feelin’ Bad” in the bar car where he taught it to Garcia. And Danko, Janis and Garcia singing together on a couch like a drunk hippie Rat Pack. And there even seems to be a bonafide, three-act drama played out on the stages of the three-city arc: The players first meet in Toronto, face some conflict, then bond on the road to Winnipeg where they rise and play their best “top this!” sets to each other. Then there’s more trouble ahead, but they all come together in different configurations for the triumphant Calgary climax. In the heart of the movie and country is Winnipeg, a blissfully black and white 1950’s Pleasantville. Suddenly the swirling-color psychedelic train hits town 12-cars-long! And just to stir the prank, it’s Canada Day, out of nowhere there are gate-crashing protesters, the summer fair’s in town, and . . . the Prime Minister pulls up alongside in another train! Meanwhile, over in the small-town nearly-empty-anyway football stadium, Janis and The Band are laying down Olympian, Hall of Fame performances. And it was also an impromptu country-rock summit, with Buddy Cage a central bridge, playing with the influential Great Speckled Bird, and inadvertently passing the audition to replace Garcia in the New Riders. “Ian Tyson’s folk-country grew into country-rock, and suddenly here was everybody,” he says of the Grateful Speckled Purple Sage Burrito Band onboard. “Jerry asked me to set up the steel on the train, and that carried over to the stage in so many ways,” like when an ecstatic Garcia and others join Speckled Bird for a sunset “C.C. Rider” that explodes with the newborn joy of the train’s country-rock-blues ménage á trois. Trains are hypnotic, mythical, inspiring, magical, eternal. And so is this transportive movie. From the Western Expansion to any kid hopping a freight out of town with Kerouac in their rucksack, trains meant freedom and untold adventure. And that’s without instruments. By some blessing from the archeological gods, some tremendous positive energy gift is rollin’ down the track, and for just a moment we’re all gonna get to be that headlight on a northbound train. Festival Express has joined a very small family of the great rock films ever made, and it comes by its magic honestly. the split-screen, too-much-happening-to-catch-it-all atmosphere of Woodstock, except common performers the Dead, Janis and The Band are in the movie! the backstage intimacy of Don’t Look Back – in fact, it may be the first real challenge to Pennebaker’s portrait – except this is in color and the songs are complete. the story-telling, big-picture of Gimme Shelter, except nobody gets killed and the Dead get to play. an Academy Award-winning cinematographer capturing The Band and music’s brightest lights like The Last Waltz, except it’s on a train trip and everybody’s six years younger. the child-like joy of A Hard Days Night set in the psychedelia of Magical Mystery Tour. 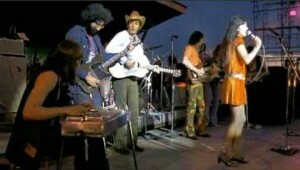 the fiery landmark live performances of Monterey Pop, with as much backstage footage as onstage. the Python madness of the textbook ‘rockumentary’ Spinal Tap, except they went too far with this one and the characters are barely believable! a feisty promoter at the center of a high-speed, week-long all-star rock ‘n’ roll freight-train like The Last Days of the Fillmore, and filmed exactly one year to the day earlier. the natural, relaxed and intimate outdoor setting of Celebration at Big Sur, but . . . you’re gonna get to see this one soon! For more Adventures in Music — you may want to check out the (Route) 66 Best live performances ever captured on film. Or for an excerpt from my forthcoming book on Kerouac, the Dead and Ken Kesey — check out arriving at a Dead show in 1982. Or for another riff that included Janis, Robert Hunter, Pigpen and a few hundred others — check out Famous People Who Don’t Have Kids. Or take the New Orleans Jazz Fest ride. Or check out some other little movies about Woodstock and the Merry Pranksters. Or when Jerry showed up at another birthday 20 years later. Or the night Furthur came back and reprised the Dead. Man, this is so Grate! Thanks for the background. One of the Gratest rock-docs ever! Hunter! That night you brought Ken Walker out in Toronto is still one of the all-time classics. What a night, what a guy, what a trip, what a movie. I’ve got the Relix issue on my shelf. Of COURSE you saw it before everybody else. Keep the Beat, my Beat brother. Mr. B! Thanks for the turn-on! Gotta get this DVD. You’re “on the train” and “on the bus” always. Thanks for taking me with you. Of course the Gratest band ever is at the heart of the Gratest “trip” ever. Thanks for bringin it home, Brother Bri. Janis brought me to tears. And you’re right — it’s the best Janis on film. Thanks for all the background on the beauty. Nice review. It’s amazing this footage survived … and somebody found it … and this exists. I wish somebody would do something like this again. Best piece on the movie I’ve found. Thanks. The best Jerry in a film of any of the great rock documentaries.